seriously: kitchen redo - the inpspiration "board"
kitchen redo - the inpspiration "board"
this is what i want to do with my kitchen. if you click on the picture, you can see it bigger. my inspiration is the pieces of the southern living at home gail pittman bountiful collection that i bought before i bought my condo. i love all of the colors together, my favorite is the teal. the background color is the color of the walls as they are - they are actually a tad lighter than that, but i am not going to change it at this point. the wood part is the floor - i like the rustic-ness of this color, and i love it with the blue on the cabinets. 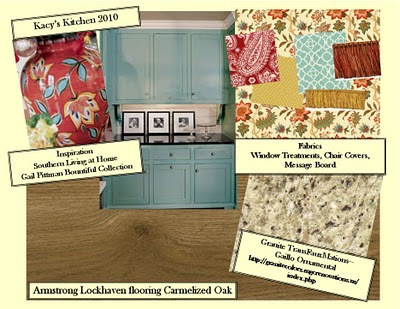 the flooring is by armstrong, it's called lockhaven and you can lay right over linoleum. the cabinet color is something i have been pondering for over a year, now, and i just finally decided that i am going to do it. that's what i will do first, i think, because it is cheapest and if i mess up the floor or counters in the process - no big deal!! the granite is kind of what i have in mind for this counter painting technique i am going to do. my boss ordered a video called counter transfauxmations, and i think this will be easy. we watched the video last week, and it seemed pretty straight forward. i think i can do the whole kitchen in one weekend. i loved how the big printed fabric matches the shapes of the vase so well...i think i will do window treatments out of that - have been searching blogs for ideas on that. the red fabric is already on my kitchen chairs, so i may introduce the other two fabrics on a message board or basket liners...maybe some place mats - we will see!! since my main goal this year is to get (almost) out of debt, i will be doing this along the way, in stages. my plan is for this to cost around $500. it will truly take me a year to get it done, but now that i have the big picture on paper it will be a much clearer process! i'm sure i will post pictures along the way. "i need a coach bag"